St Illtyd’s Church, Llantwit Major, South Glamorgan, Wales. OS grid reference SS 6990 9580. 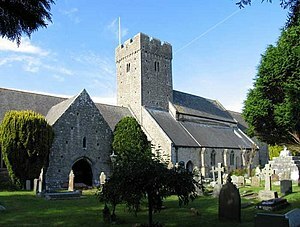 The Norman parish church of St Illtyd (Illtud) is located on Church Lane at the western-side of the town of Llantwit Major or, in Welsh, Llanilltud Fawr, in the Vale of Glamorgan. This large three-sectioned Norman church, one of the oldest in Wales, houses three very interesting Celtic stones with Latin inscriptions in memory of saints and kings that were associated with a monastic college founded here by St Illtyd at the beginning of the 6th century AD. There are also two medieval grave-slabs, one belonging to an ecclesiastic, some medieval wall paintings and two other ancient stones. At the far west-side of the church the Ragland Chantry Chapel stands in a ruined state. The town of Llantwit Major is 9 miles south-east of Bridgend and 15 miles south-west of the Welsh capital, Cardiff. Close-by the church are the earthworks of the Roman villa of Caermead, dating from the 1st century AD. Housed within the Galilee Chapel of the 13th-15th century church, the old western part that dates from c1100, are three very interesting antiquities: a Celtic cross and two memorial stones with carved decoration and Latin inscriptions. These date from between the 9th-10th centuries and originally stood outside in the churchyard. Cross no 1 ‘The Illtud Cross’ or Samson’s Cross stands at just over 6 feet high and dates from the 10th-century. Although only the base of the gritstone cross remains the decoration is very good, and there is interlacing and key-patternwork with inscriptions in the middle and at the top. The top inscription (front) reads: SAMSON POSUIT HANC CRUCEM PRO ANIMA EIUS or ‘Samson placed his cross for his soul’ and on the reverse side: ILTUTI SAMSON REGIS SAMUEL EBISAR or ‘for the soul of Illtud, Samson the King, Samuel and Ebisar’. Samuel was probably the carver of the cross. Cross no 2 is ‘Houelt’s Cross’, a 6 foot high disc-headed or wheel-head cross from the 9th-century AD. This has fretwork and patternwork on its lower front section and Celtic-style knotwork, interlacing and key-patterning on the wheel-head, but on the base there is a Latin inscription recalling Houelt (Hywel) the son of Res – probably Rhys ap Arthfael, King of Glamorgan, who died in 850 AD. The inscription reads: ‘In the name of God the Father, and of the Son and of the Holy Ghost’. ‘This cross Houelt prepared for the soul of Res his father’. And no 3 ‘Samson’s Pillar Cross’ is 9 foot high and of the 10th-century. On both sides of this there is a long-winded inscription which reads: IN NOMINE DI SUMMI INCIPIT CRUX SALVATORIS QUAE PREPARAVIT SAMSON ABATI PRO ANIMA SUA ET PRO ANIMA IUTHAHELO REX ET ARTMALI ET TECANI and when translated ‘In the name of the most high (God) begins the cross of the (Saviour) which Samson the Abbot prepared for his soul, and for the soul of Iuthahelo (Judwal) the King and of Arthmael and of Tecan’. There is also a 7 foot-high carved cylindrical, pyramidal-shaped stone that may have originally been part of a pagan altar, and two smaller stones that are now worn and damaged but may once have been crosses bases. St Illtyd or Illtud (450-530) may have been a native of Brittany, though some historians think he hailed from Breconshire. However, by about 460 he was living in south Wales and eventually, after a few years, entered in to the service of King Arthur as a knight and was, according to the legend, one of the keepers of the Holy Grail. At some stage he became a Christian and retired from the world to live as a hermit beside the River Hodnant in south Glamorgan. Here he met St Garmon, his uncle, and together they re-established a monastic school (Bangor Illtud Fawr) where an earlier monastery known as Cor Tewdws (College of Thedosius) had fallen in to decay. The date of the foundation of this monastery is uncertain but it’s beginnings were c480 AD and, certainly by 500 AD the monastic school was flourishing as a renowned centre of learning with many saints being trained there, including St David. A monastery continued to exist uptil the early 12th-century but then fell on hard times, but it was later reformed as a Benedictine house of Tewkesbury and lasted until after the dissolution of the monasteries in 1547. As for St Illtyd he is thought to have died at Dol in Brittany about 530 AD. However, Welsh historians have always claimed that he died at his monastery in south Glamorgan, or maybe he died at Bedd-Gwyl-Illtyd near Libanus, Brecon, in southern Powys? We may never really know. Allen, J. Romilly., Celtic Crosses Of Wales, Llanerch Publishing, Felinfach, Dyfed, 1989 (text originally published in Archaeologia Cambrensis 1899). Spencer, Ray., A Guide to the Saints Of Wales and the West Country, Llanerch Enterprises, Felinfach, Lampeter, 1991. Barber, Chris & Pykitt, David., Journey To Avalon, Blorenge Books, Abergavenny, Gwent, 1993. Bord, Janet & Colin., Ancient Mysteries of Britain, Diamond Books, 1994. Categories: Ancient Churches / Chapels, Ancient Crosses, Inscribed Stones, St Illtyd's Church at Llantwit Major in South Glamorgan | Tags: Ancient Crosses, St Illtyd's Church at Llantwit Major in South Glamorgan | Permalink. Hiya, I am really glad I’ve found this info. Today bloggers publish just about gossips and internet and this is really annoying. A good web site with interesting content, this is what I need. Thank you for keeping this website, I’ll be visiting it. Do you do newsletters? Can not find it. No sorry Nauru I don’t have newsletters. But please enjoy the blog sites. Click on ‘follow’ if you want to be up-dated regularly.